This is a different kind of Transformation Tuesday post. And in it, weight isn’t going to be discussed. First, because for me, it’s never been about the number on the scale. It’s been about what I see in the mirror, how I feel every day. Even before pregnancy. I also hate that once a woman becomes pregnant, her weight and how much she gains is suddenly an open topic for any and all to discuss. No. What that woman weighs and gains is for her and her doctor. Unless she chooses to speak about it herself, let it lie and stay away. Hitting the gym, 18 weeks out from what was to be my first figure competition in October. June 13, 2014. On June 13 of this year, I thought, in all seriousness, I was taking a different kind of progress photo at the gym. Sporting my latest Goodwill find, a little modified because t-shirts make me sweat SO bad in the gym in the summer, I snapped a quick photo. I was working my way into a training program that would hopefully have me stage ready by Oct. 26 of this year in the Granite State Open. A competition I planned to compete in with a friend of mine who had done a few shows already. 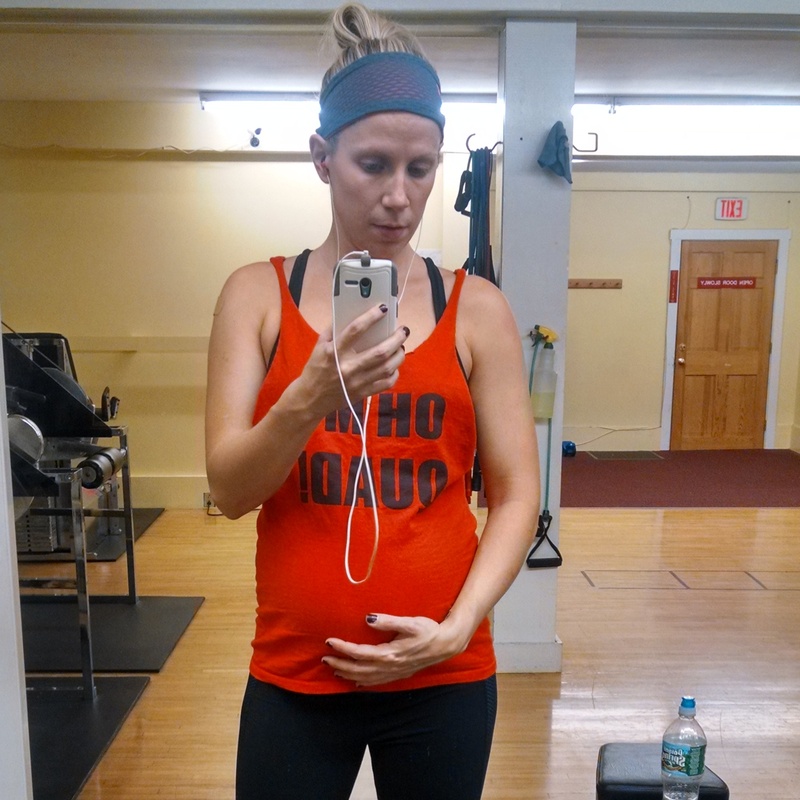 I had no idea that nine days later, I would be finding out I was five weeks pregnant. 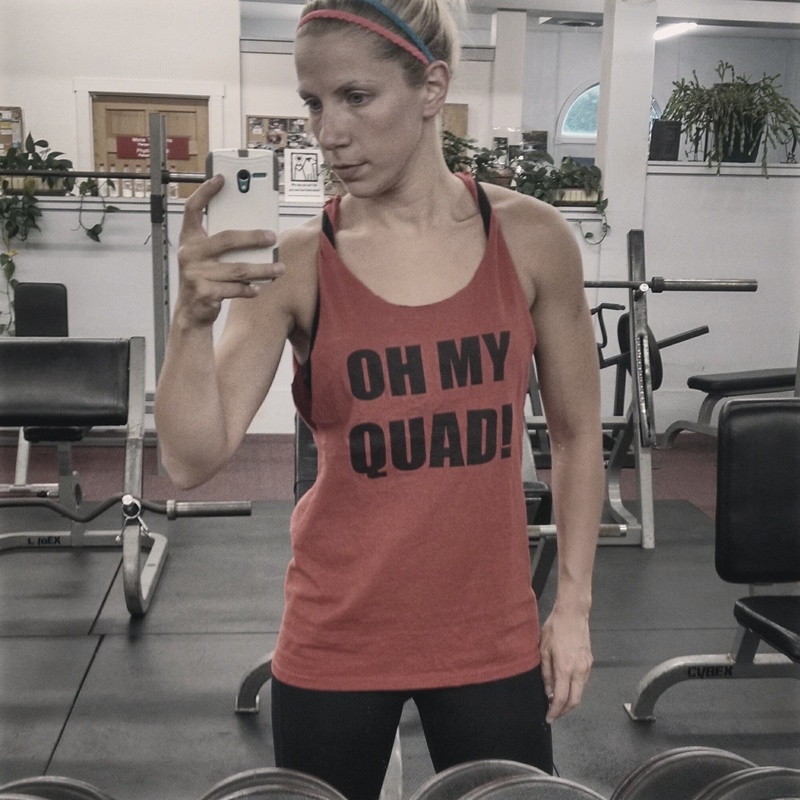 I knew the body could do amazing things having had several friends and family members go through pregnancies, but it wasn’t until I myself was experiencing it first hand that I realized just what my body is truly capable of. It’s amazing how much the body changes and adapts to what is going on inside, and just how much you’re still capable of doing while it’s all going on. That first week I knew I was pregnant, I thought I’d have to change so much more with my routine, and had planned to, as time passed and the pregnancy progressed, make those changes and adaptions. At almost 28-weeks… I haven’t really had to change anything. I go to bed a little earlier of course. I eat an extra meal (or two) a day. I’m dealing with a lot of severe pain with my spinal disease. But otherwise, it’s all still business as usual. I’m still working full time, teaching classes, hitting the gym three times a week, doing yoga. I’m still out there raking away at the leaves (although my husband wouldn’t let me shovel snow either time we’ve gotten it so far). Cleaned up my gardens… and so on. The body is a well oiled machine. And if you treat it right, it will stay that way. Even when it’s creating another life inside. I can still see the tips of my toes, but I know nearing the third trimester, they will disappear. Nearing the end of my 27th week of pregnancy. Prepping for something else completely now. 22-weeks after snapping what was supposed to be a photo of me pre-competition journey, I snapped another photo in the same shirt. It’s one of the only few of my own that still can accommodate that growing belly of mine (I’ve since raided my husband’s side of the wardrobe and taken claim to some of the shirts he’s no longer able to wear because I’ve turned him into a meat head over the years and he likes his weights too). In the photo, to the quick looker, not much has really changed. That baby bump is certainly there, and there is no way to disguise or hide it. Baby Rebel even pushes himself out against my baggiest sweats. But my muscles have become a little softer, the result of many, many weeks of continuous “maintenance mode”, cutting out all supplements, and being a little looser with my diet here and there (two bowls of Trix cereal before bed is totally acceptable, right?). And because I’m in maintenance mode and can’t really push myself, my strength is waning some. In the grand scheme of things, it’s nothing. Nine months of having a front row seat to watching my body do something glorious – transform and create life.